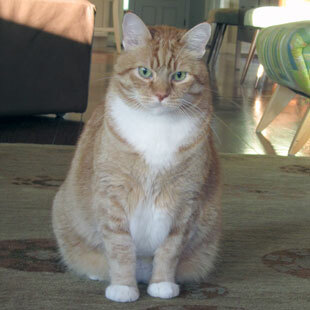 By: Dr. Deborah Linder, DVM, DACVN | March/April 2013 | How do I know if my pet is overweight and what should I do about it? How to determine if your pet is obese or overweight and how to feed them. Studies show that up to 60 percent of dogs and cats are obese or overweight. To see if your pet is fat or just fluffy, feel over its rib cage, which should be no more padded than the back of your hand. If it is, your pet may be overweight, which can lead to diabetes and breathing problems, as well as a shorter life. Work with your veterinarian or board-certified vet nutritionist to -select a diet low in calories. A lower-calorie food may also allow your pet to eat more volume and feel full. Remember: treats, supplements and dental chews all add calories. Dr. Deborah Linder, DVM, DACVN, head of Tufts Obesity Clinic for Animals, one of the nation's first obesity clinics geared especially to pets.